You might have noticed a couple of news items from F5 this week that appeared related. If you noticed you were right, they are. First, we were very excited to announce recognition of our hard work on our SSL VPN solutions: F5 Positioned in Leaders Quadrant of SSL VPN Magic Quadrant. Second, we were even more excited to announce adding industry-leading support for Android’s 4.x OS, enhancing its SSL VPN capabilities. Why would be excited about that? Because mobile devices and virtualization (desktop, a la VDI, and server, a la cloud) continue to drive the need for secure remote access at a scale never before experienced by most IT organizations. While web monsters and primarily web-focused organizations have long understand the critical nature of scalability to their business, IT shops for whom a web presence was only somewhat important have not necessarily invested in the infrastructure or architecture necessary to truly scale to meet the increasing demand. It is increasingly the case that IT orgs of all shapes, sizes, and concerns must look to the scalability of its infrastructure to ensure its ability to service users inside and outside the data center via an often times dizzying array of clients and technologies. SSL VPNs arose from similar needs many years ago, out of the overwhelming complexity associated with IPSEC and the inability to support every end-user from every platform available. An SSL VPN generally provides two things: secure remote access via a web-top portal and network-level access via an SSL secured tunnel between the client and the corporate network. By providing both modes of access via an established, ubiquitous protocol (SSL), such solutions are better able to provide end users with access to resources regardless of platform. By deploying such a solution on a proven, highly scalable platform (BIG-IP), such solutions are better able to provide IT with the means to scale not only the solution but its requisite infrastructure services. 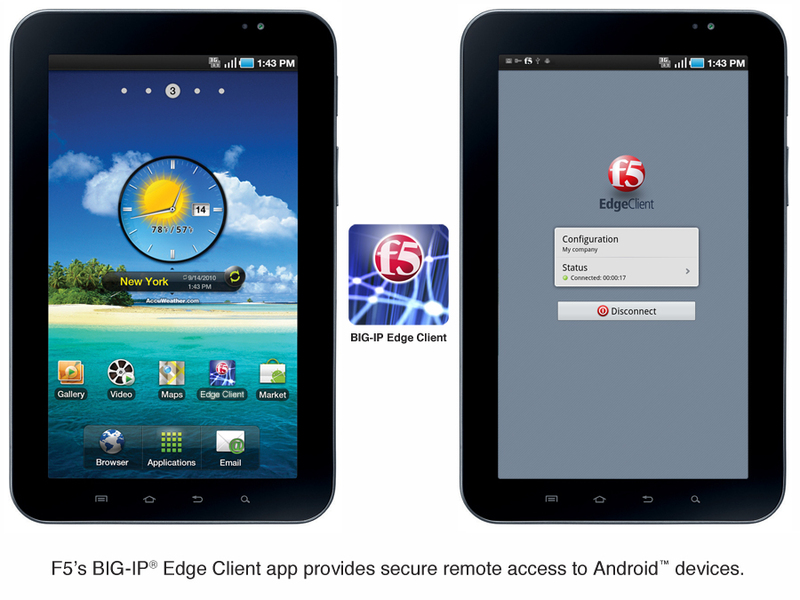 BIG-IP® Edge Client™ is the industry’s first SSL VPN solution that provides comprehensive security and mobile access for all devices running Android 4.x (codenamed Ice Cream Sandwich). It’s free, and you can get it anytime you like. Right now, if you want – go ahead. Grab it, I’ll wait. Oh, you aren’t running Ice Cream Sandwich yet? If you’ve got a “rooted” device, we’ve got your back there, too, with our BIG-IP Edge Client for “rooted” devices. Additionally, F5 is introducing enhanced support for its BIG-IP Edge Portal™, which provides managed application access to enterprise web applications such as SharePoint, wikis, and Intranet sites. This is that web top access mentioned earlier – a secure means of providing access to resources from any device without giving away the keys to the kingdom via the more open corporate network access route. And ultimately, this two-pronged approach to secure remote access afforded by SSL VPN solutions like BIG-IP Edge Gateway will continue to be important to corporate remote access strategies precisely because of the need to differentiate levels of service and access based on location, device, and user – something only a context-aware solution can provide. This is why validation of external sources of our work in the SSL VPN arena is exciting – because SSL VPN continues to be a significantly more flexible option to traditional IPSEC VPN connectivity and with the continued growth of mobile devices and demand for technology like VDI, it will certainly only continue to expand its applicability in the enterprise as scale and flexibility become more and more necessary to meet the diverse, distributed demand of clients. F5 Friday: The Mobile Road is Uphill. Both Ways.